You mentioned 'feigned' perspective and I think that's an issue here: granted it's a bunch of organic Giger-forms and stuff could be pointing every which way, but your construction feels a little wonky in that we're looking up into the ceiling orifice whereas the dais the monster's on looks to be vanishing to a horizon around that point. 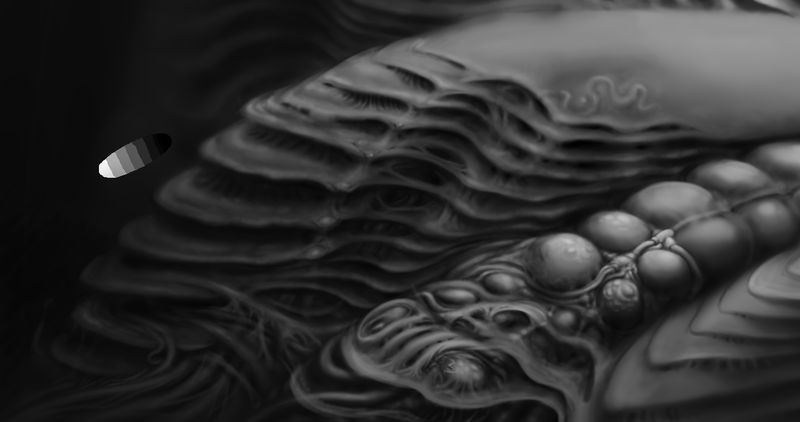 Quick example here: I moved it up to where I estimated that ellipse would occur in a level creepy-womb-thing, 'cos it's always good to reinforce a consistent perspective; the extra height is kinda dramatic too! Lately in PS I've been using the polygon tool with max. indented sides to get quick neat guidelines (tiny down arrow next to the blob icon for the options menu there). Nice observations. Cool to see something I've looked at for so long suddenly with an altered composition. I do like the extra height in yours. Almost makes mine look claustrophobic. Maybe part of why it seems like the the viewer can see unnaturally up into the ceiling is due to the far portion of the center, ceiling orifice's inner wall sagging down too far. Not as dramatic as yours. Less off inner orifice wall is visible. I want to leave more focus on the creature itself and less on the environment so I've only adjusted the ceiling upward a little bit. I may even end up more tightly cropping out the environment before I finalize this, leaving the creature even more front-and-center. Went with Facet's tip and added more vertical space. 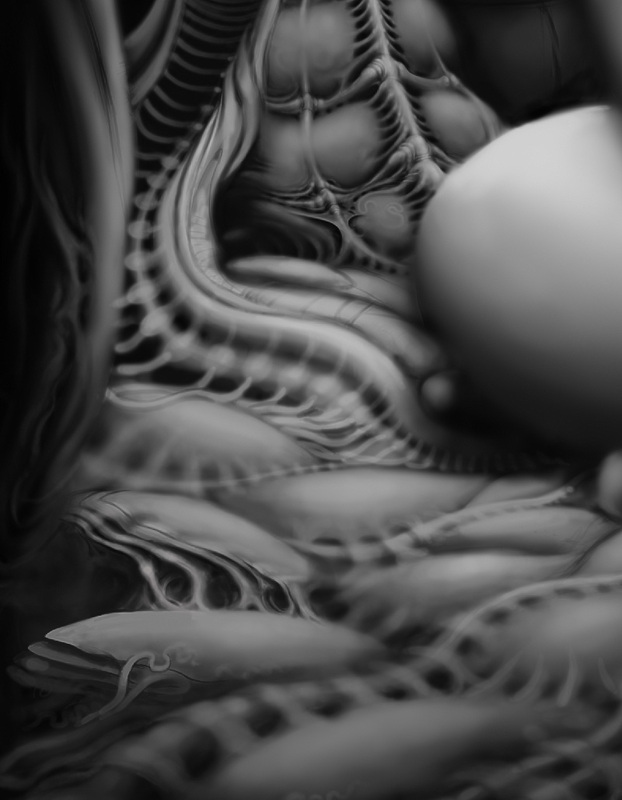 Was going to refrain from going all Zdzislaw Beksinski on this one, but I think I'll see where this leads, instead. Well . . . this project has become incredibly laborious. Detail threshold is quite high now. Bitten off more than I can chew (tolerate, more like it), or headed for triumph? Wait and see.